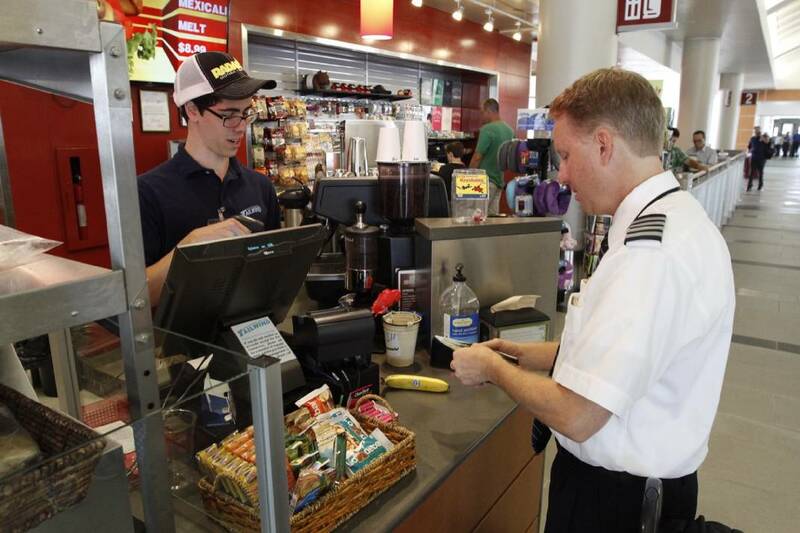 A pilot at Chattanooga Metropolitan Airport makes a purchase at a Tailwind Concessions site in the terminal. Sales of food, drinks and other concessions at Chattanooga Metropolitan Airport have almost doubled since 2014, and officials are eyeing added retail space past the security checkpoint to grow them further. Lovell Field officials also say they are exploring the idea of a private club to cater to frequent fliers. Concessions revenues at the airport have grown from $1.5 million in 2014 to a projected $2.7 million by year's end, said Terry Hart, the chief executive officer at Lovell Field. Under a contract with Tailwind Concessions, the airport keeps about 10 percent of sales, he said. Jeff Switzer, Tailwind's CEO, said that sales have climbed not just due to rising boarding numbers at the airport, which has had four consecutive years of record passenger traffic. Switzer said that revenue per passenger enplanement, a key measure for the company, was $4.92 in 2016 at the airport. That jumped to $5.32 last year and is on track to hit $5.86 in 2018, Switzer said. "It's not just more people but we're doing what we need to get more money out of passengers," Switzer said, such as asking customers if they want a bottle of water with a purchase or an extra cup of coffee. Switzer said revenue per passenger in Chattanooga is one of the highest among the 20 airports it services. Another reason for the increase is that a majority of concessions at Chattanooga Airport are located past the security checkpoint, officials said. "In regional airports, that's where the money is made," Switzer said. "Everybody comes to the airport, goes through security and sits down." Hart said that in terms of concessions prices, Chattanooga is "in line with cities our size." "We do a comparison of prices," he said. "We're conscious of that fact." Hart said the airport's new long-range plan foresees putting in even more concessions space past the checkpoint. The plan calls for increasing the number of gates to service more aircraft, and that includes adding space for customers such as for retail sales, he said. "That's where it needs to be," the airport chief said. "We have retail space pre-security. That's not where it needs to be. We'll work toward that as we plan for the future." Warren Barnett, an Airport Authority member, asked Hart recently at a meeting of the panel if there's a thought of adding a private club for airport users. Hart said he hears that suggestion quite often from frequent fliers. "That's on our list to explore," he said. Also, Hart said, he has discussions about menu items with Tailwind. "They listen to us," he said. "They get it that we're different than the O'Hare's or Atlanta's or Charlotte's, and that's important." Hart said the change to Tailwind was made when work started on the 2013 terminal renovation. "We knew we needed to change in the concessionaire," he said.